LONG BEACH — During this season of brotherly love and kindness toward your fellow man, the aggressiveness and tight racing of the local Cal 20 fleet gives way to … well … aggressive and tight racing that is a bit more subdued, in the annual Cal 20 Fun Run hosted by Long Beach Yacht Club. 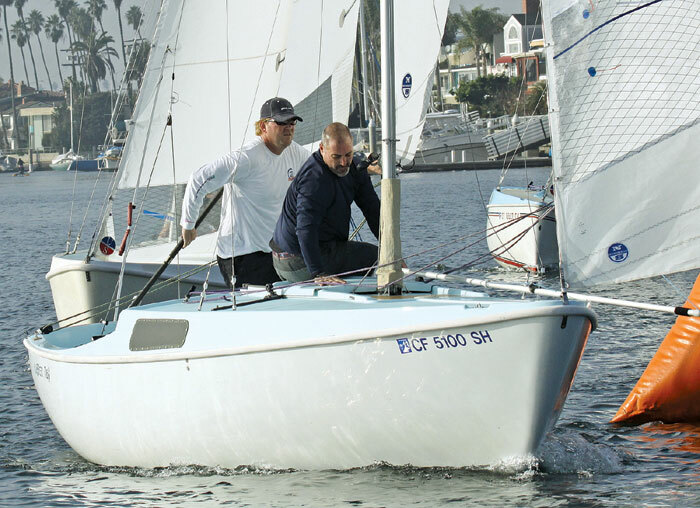 Keith Ives and Chuck Stevens, of Alamitos Bay Yacht Club, took first place honors Dec. 8 against 11 other Cal 20s in what started out as a most challenging day. With a solid overcast and virtually no breeze, the race committee postponed racing for more than an hour, before they sent everyone off in 3-4 knots of wind. Once the first race was completed, the wind stayed consistent, allowing a full eight races on the day. All of them were tightly bunched with regular lead changes from race to race. Second place went to Sam Heck and Chris Raab, also of Alamitos Bay YC, who were only three points behind Ives and Stevens. Third place on the day went to Chuck Clay, also of Alamitos Bay YC. Unlike most of the Cal 20 regattas held in the “sometimes” chop and heavy breeze of Long Beach Harbor, this event is held in the shelter of Alamitos Bay’s Turning Basin. This traditional holiday-time regatta puts the emphasis on fun, with joking and well wishes heard from boat to boat. As organizers say, it’s a good old-fashioned day of racing with friends and family. The five-buck entry fee was handed to the race committee runabout boat on the water. No skippers meetings, no formalities, just a fun time for all. Trophies were given out to the top finishers — at the race committee boat — and everyone sailed back to their respective club, to relax and reflect on the day’s racing.